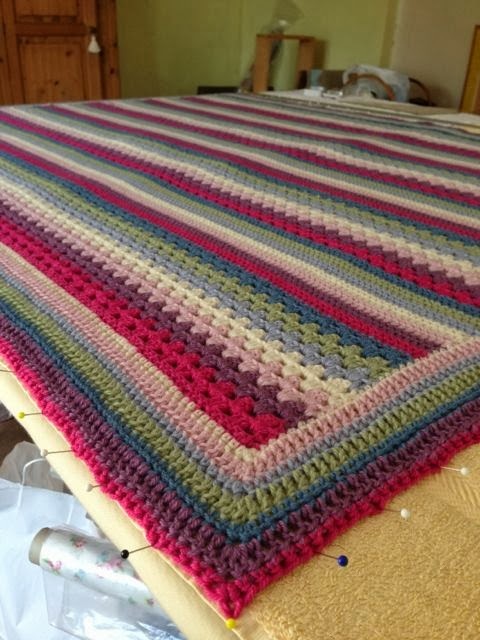 Blanket Finished, Blocked and Waiting to Dry! 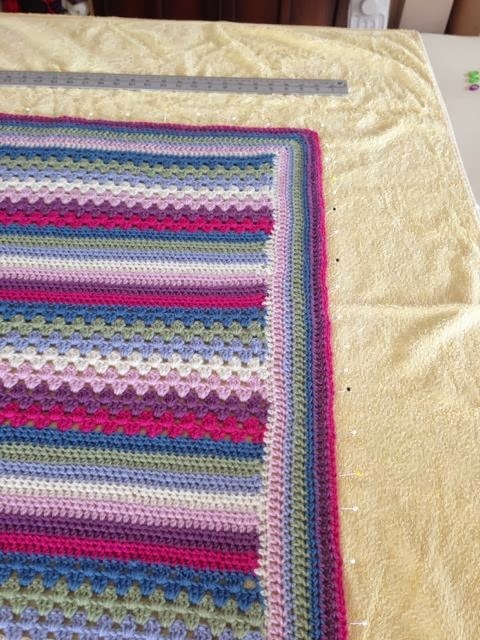 I’m nearly having a Ta Dah moment as my lovely stripey blanket is more or less finished. 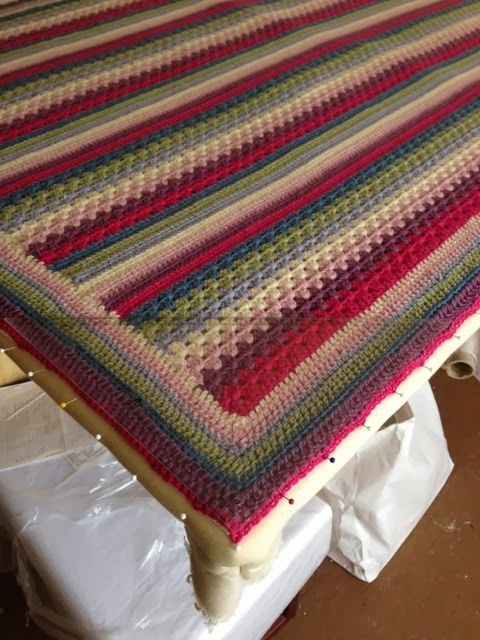 The last round of the border was completed yesterday and now it is in my workroom, pinned to within an inch of its life and doused in water. 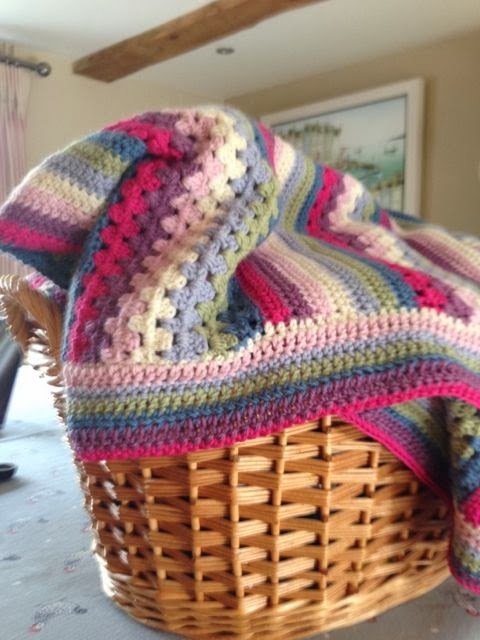 You can read about the beginnings of this blanket here and after all this time (it’s taken me six months – although in between other things) it’s finally finished. 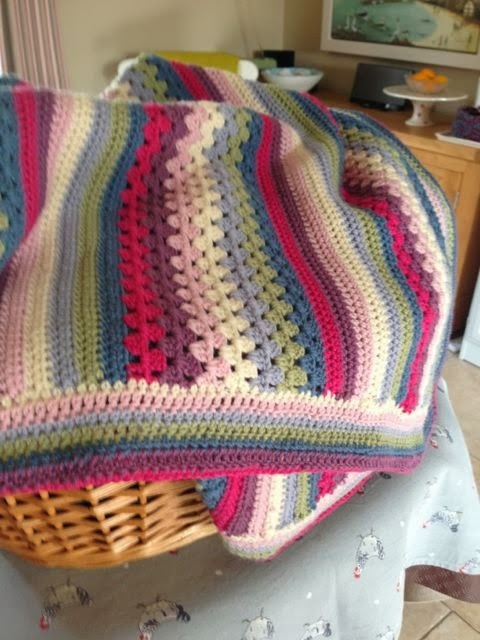 I was going to just do granny stripes, a la Lucy’s pattern at Attic 24 and I started out with good intentions but I always have to change something – I think it must be because I don’t like being told what to do (Mr Hippy would agree with this, I’m sure) so it turned into Granny Stripes, followed by plain stripes of half double crochet (US terminology), but overall I do like the finished article. 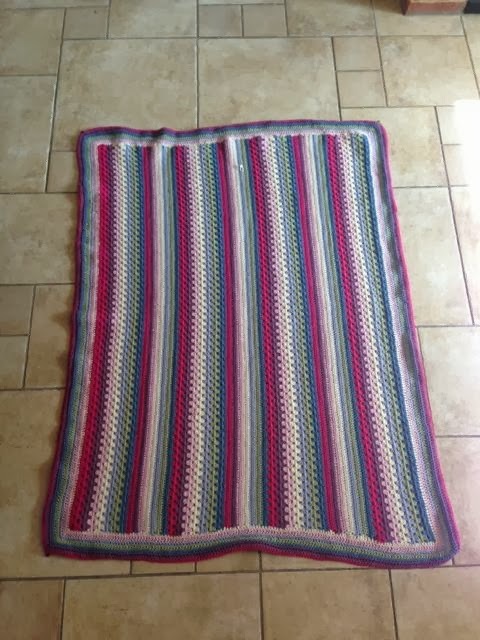 I wasn’t too sure what to do for the border but I wanted to keep it simple so I ended up using the same seven colours and did a mixture of single crochet, half double crochet and double crochet and it frames it really well. The next stage was to block it. 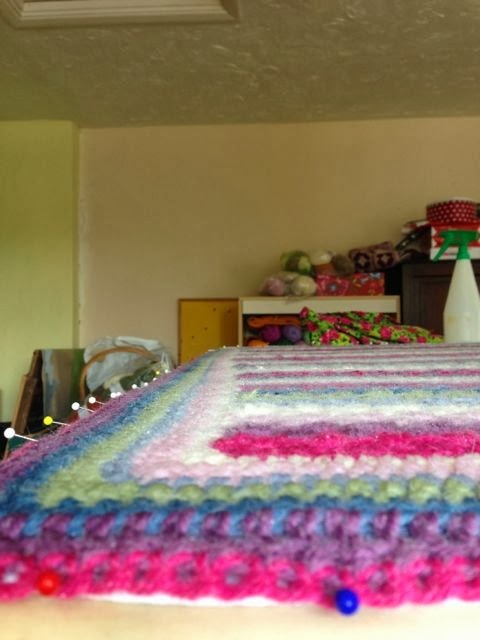 Now I looked for ages on the web to find out which method to use – and there are so many – but in the end I plumped for pinning it out and then spraying it with water to make it wet but not soggy. 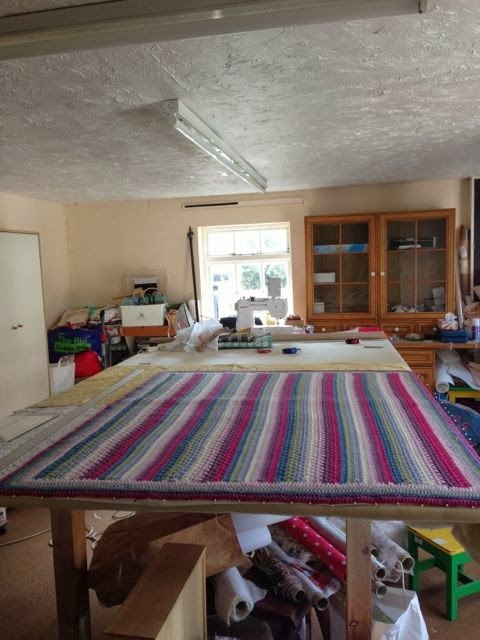 I am so lucky that I have a workroom in which to leave it – the only drawback is that it’s not heated so it will take a bit of time to dry completely, but it’s not in anyone’s way so I guess it doesn’t matter. 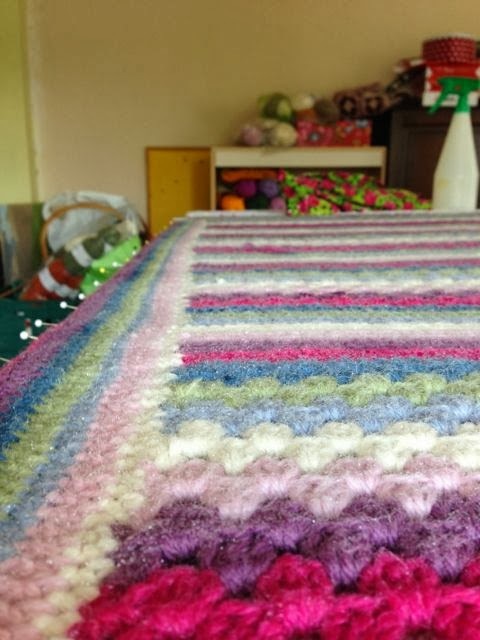 What are your best methods for blocking blankets – I would love to know. 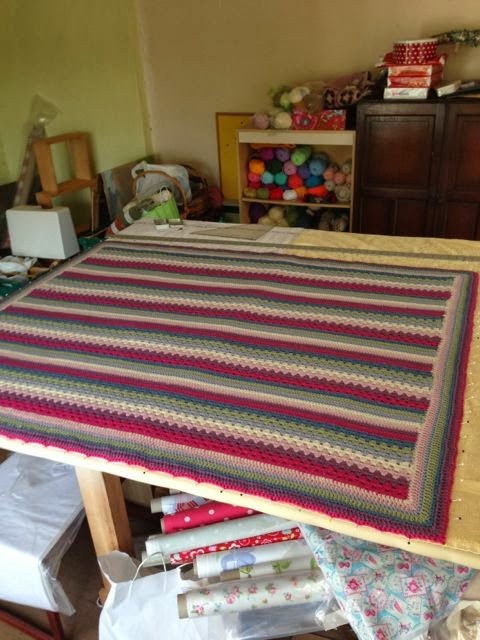 Onwards to the next project now – can’t sit still you know! I’m not a floaty person but I have to make this! The colours go together very well. I'm not lucky enough to have a large unused table. So I use the ironing board and spray and block big items in sections. Your method sounds much better.